When it comes to hair, it is quite normal to get scared to try any new product loaded with chemicals. Though we can take a little risk with skin products, we always try to be in safer side while trying any hair product. Most of the skin products might lead to acne, allergies, rashes and breakouts if not suitable and these problems can be mostly reversed with good skin care. But that is not the case with hair products. Wrong hair products might lead to even gray hair which cannot be reversed easily. So, it is always worth to pay attention on what you are putting on your hair. I always like my homemade hair oils like amla oil and curry leaves oil. However, it is not always possible for everyone to make at their home on their own. There are some hair-friendly products from natural brands that can be really helpful for such people. One such natural hair care products I recently came across are Banjara's Samvridhi hair care range of products that include a hair pack and a hair oil. 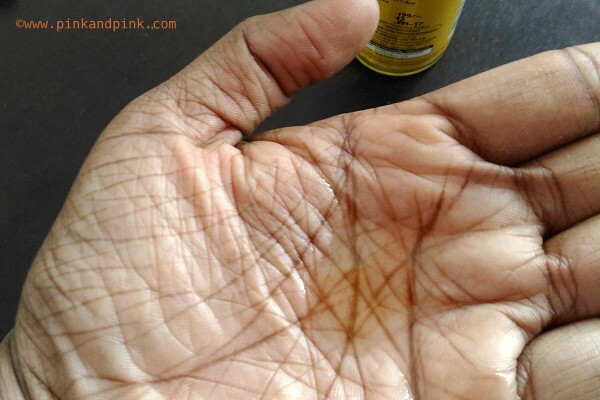 This review is all about the Banajaras Samvridhi hair oil. Under clinical test conditions, hair fall was reduced by 64% and hair growth was increased to the extent of upto 8 cm over a 8 week period. The oil acts on your hair at 3 levels. It coats the hair shaft and prevents it from breaking. The oil penertates into the scalp and stimulates hair follicle to grow thereby increasing the anagen gair. The hair oil helps in reducing all hair problems and damages leading to strong and lustrous hair. The brand suggests to use the oil at least 3 times a week to see best results. Price: Rs.199 for 125 ml bottle. Apply the Banjara's Samvridhi hair oil to the hair ans scalp. Massage and leave it for at least 30 minutes so that the oil gerts absorbed well and then wash.
My eyes went to the ingredients list as usual before using the product. I was little skeptical about the ingredient 'Vitamin E 0.1% Base q.s'. I did not want to leave my question as such. I directly checked about this ingredient with the brand. I was told it consists of sunflower oil and the source of Vitamin E is Wheatgerm oil. I was completely alright and got the confidence to try this hair oil. There are some hair oils that really do well in the market but contains mineral oil as base mostly. Though I am not sure how much it is harmful, I want to stay away from them nowadays. On the other hand, the natural hair oils costs are not pocket friendly for every one. 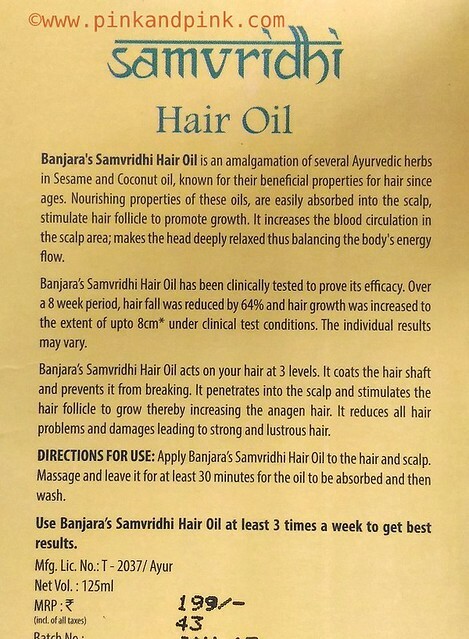 I am really impressed with Banjara's Samvridhi hair oil which contains 38% of Sesame oil, 25% of Coconut oil and 10% of olive oil along with other natural ingredients like Bhringraj, Hibiscus, Amla, Henna, Aritha, Methi. Shikakai, Brahmi, Neem and Pipali. The oil is basically an amalgamation of many herbs in sesame oil and coconut oil. As you know, sesame oil and coconut oil are the highly preferred hair oils in India all the time. If you are someone like me who researches about natural care for your hair, you must have known the goodness and effectiveness of all these ingredients. It is not easy to see a hair oil with so much of natural ingredients nowadays in a pocket-friendly price. Yes, the product costs just Rs.199 for 125 ml bottle. 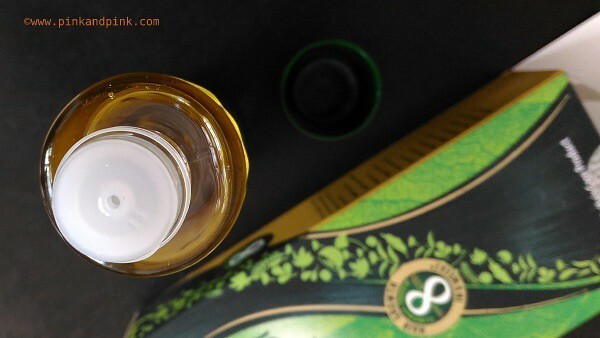 The oil comes in a transparent plastic bottle. We just need to prick a small hole in the screw cap to start using it. The bottle is not leaky and hence it is travel-friendly. I just take required amount of hair oil and massage on the scalp and work towards the end. I make sure that the tip of the hair also gets covered well. I do it in the early morning as soon as I get up and leave it as such till I take bath. I do not prefer to apply this oil in the night as it has a strong aroma which might not be comfortable for everyone. The oil gets easily absorbed once we apply on the scalp. It is not so sticky inspite of the long list of herbal ingredients. It is easy to apply and cover the whole scalp and hair with your fingers. The oil is pretty good and controls the frizz well. It gave enough moisture to the hair and made it smooth. I have not measured my hair growth and cannot comment on their 8 cm hair growth claim. But being the fan of herbal ingredients, I can surely tell that this oil can help you to control the hair fall, promote your hair growth and help you to deal with other hair problems like premature graying, dandruff problem, dry hair problem and so on. 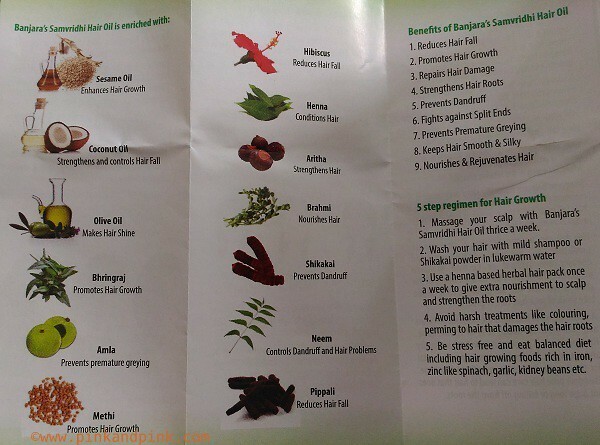 With amla, bhringraj, brahmi, hibiscus, henna, shikakai, neem, sesame oil and coconut oil, a hair oil cannot go wrong. Neem can help in dandruff and itchy scalp problems. My hair feels nourished just like when I use homemade hair oils. Banjara's Samvridhi hair oil is a boon for every person who wants to give natural care to their hair. It contains all the hair-friendly herbal ingredients in a single bottle. All the necessary ingredients are added in this hair oil to make sure that all your hair problems are addressed with this single hair. You must try this hair oil if you want to avoid chemical hair products. I definitely recommend this hair oil for everyone. There is a Banjara's Samvridhi hair pack available which can also be tried to get better results. 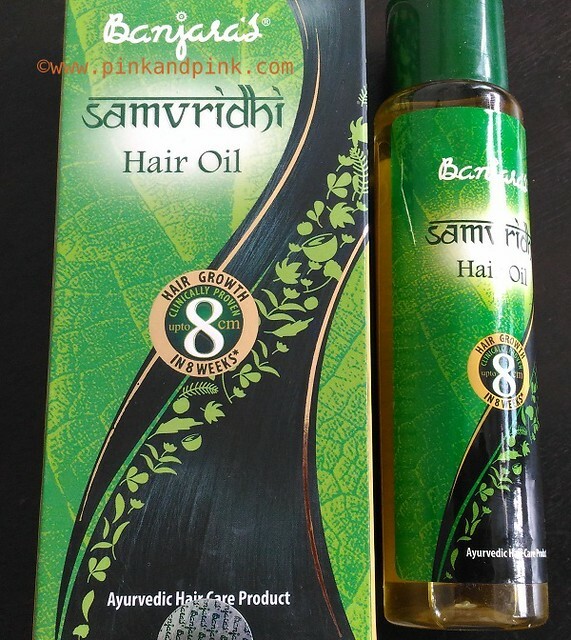 Have you ever used Banjaras Samvridhi hair oil? If yes, we are interested to know about your experience.